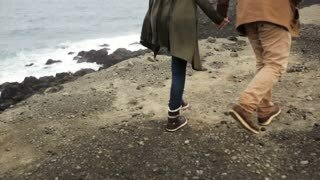 Close-up view of young couple walking on the edge of the cliff near the sea. Man and woman holding hands, romantic date. Back view of young couple walking on the cliffs near the sea in windy day, holding hands on romantic date on nature. Back view of beautiful young couple holding hands on the beach and walking on stones. Sea waves splashing. Amazing view. Slow motion.